The Herald's photojournalists pride themselves on vivid, colorful, newsy photography every day. And they almost always produce images worth framing -- sheer art. Tiffany Tompkins-Condie's Monday Gallery feature is a great example of such work, and of the extra thought and planning that requires. 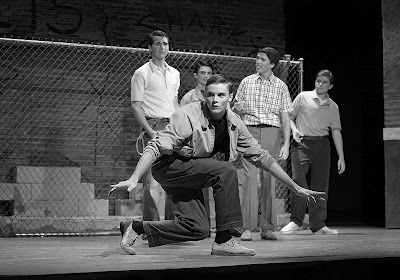 She was assigned to shoot Manatee School for the Arts' dress rehearsal of "West Side Story," to accompany education reporter Chris Hawes' story on the teacher's successful effort to infuse ethnic authenticity into the production. From that shoot came this wonderful image, which Tiffany converted to black and white to fit the era of the setting better. Just as she describes the actors in her blog post "Through the Lens: Play it cool," Tiffany also captures that "cool-cat style" and "athletic grace." Thanks for taking us back in time, Tiff. What a week! We successfully migrated Bradenton.com to its new look, and feedback has been overwhelmingly positive. After the launch Wednesday morning, we have had back-to-back record traffic days on our web site, too. That's been quite a rush! We did our fair share of promotion, too, with house ads in the Herald, Facebook postings, blogging and the like. One of our favorites: Web developer William Winter did a "talkback" with Bay News 9. Here's a link to the video. And he's now apparently a local star -- they recognized him today at his favorite MacDonald's! We had tremendous help from McClatchy Interactive trainers and developers. Marcia Yates and Lori Mirrer were here with us all week, giving us 24-7 hands-on support. And as they left today, we felt like we'd graduated. The new Bradenton.com has launched! 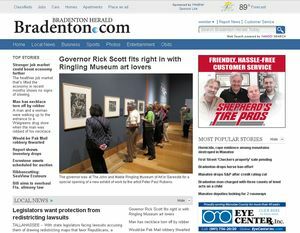 Good morning, Bradenton.com users: We've launched! An entire crew has been here since 4:30 a.m., working out kinks and links and all kinds of techno bugs. But Bradenton.com has reintroduced itself -- and we think you're going to like it. Have a question? Here's the FAQ sheet on our site for starters. Here's a link to my column today, and to the feedback form we hope you'll use. Today begins a week we've been anticipating at the Bradenton Herald for quite a while: Our web site is getting a fabulous new look. * Easier to use. Our readers will have a better overall experience when using Bradenton.com. * Much faster. The speed of delivering story pages and other content to our readers has increased. * Sharper, cleaner in look. * A showcase for our photos and photo galleries. The site is designed to showcase the stunning photography and visual journalism produced every day by the Herald’s talented photojournalists -- and they are thrilled. So, barring any unforeseen technical problems, you'll be able to check all this out starting about 7:30 a.m. Wednesday. We'll keep you posted on progress, and we'll provide a special feedback form to compile and respond to your comments. One of the sweetest blogs this week was by Herald columnist Vin Mannix on his "Mannix on Manatee" blog. He captured the most touching moment of the Spirit of Manatee Awards on Wednesday, which we both attended. 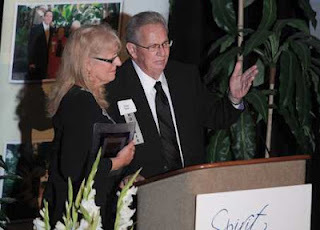 Chris and Sue Egler were among those honored for exemplary service for our local non-profit organizations, seen here in Paul Videla's photo. They were recognized for their "Volunteer Spirit" -- and it may be the most deserved award in a long time. Chris was diagnosed with cancer last year, and he has already outlived the doctors' prognoses. And he hasn't stopped giving. Chris threw out the challenge to the event's record crowd: Volunteer. Give. Remember the power of the individual. The standing ovation he received was a most promising sign. Regular readers of the Bradenton Herald and Bradenton.com have seen the byline of Josh Salman gracing the business cover, 1A and the homepage just about every day for the past two months. 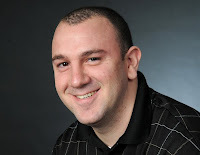 Josh is our new business reporter, and he hit the ground running. He also has taken over our business blog, Manatee Money Matters. Josh plans to weigh in throughout the week, giving you some behind-the-scenes insight into the stories he's covering. Josh joined the Herald from The Charlotte Sun, where he covered local government, business news and just about everything else for more than two years. He has also worked at several other Florida newspapers as an intern, sports correspondent and college editor. Give Josh a call if you have story ideas or can be a great business contact. His direct line is 941-745-7095. His email: jsalman@bradenton.com. 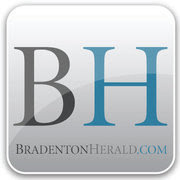 Great news for smart phone users: The Bradenton Herald app is now live in the Android Marketplace and in Apple's iTunes store. Herald Web Developer William Winter sent out a couple gleeful notices, as he has been working on this for a while. And I must admit: It certainly has made it easy to troll through Bradenton.com sections on my Droid. Here's a belated plug for one of the more heartwarming annual events in the heart of Bradenton: the national anthem tryouts at McKechnie Field. National anthem tryouts fill McKechnie Field | CLICK for the GREAT VIDEO!